Leroo La Tau is ideally situated on a cliff, overlooking the Makgadikgadi National Park in Botswana. Leroo La Tau is ideally situated in the banks the Boteti River on the border of the Makgadikgadi National Park. 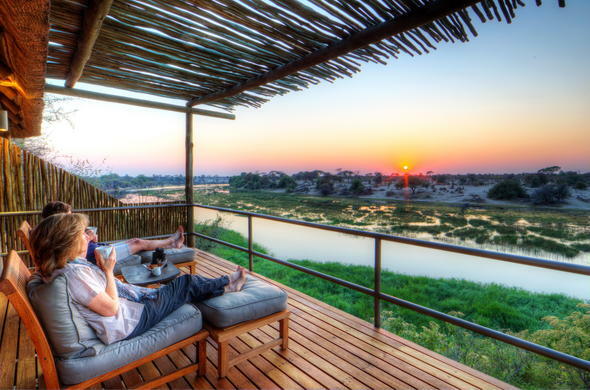 This Botswana bush lodge is situated on a cliff overlooking Boteti River. The main reception and lounge area at this Botswana safari lodge are located at the top of the cliff, ensuring guests can enjoy spectacular views over the surrounding areas and game coming to quench their thirst at the waterhole. Guests visiting this Botswana lodge can look forward to luxury accommodation in elegant chalets situated along the cliff. Each chalet sits on a raised wooden platform and boasts a spacious en-suite bathroom. Enjoy exciting game drives during the day and evening. Guests can expect to see Lion, Zebra, Wildebeest and a range of other African wildlife. Alternatively, guests staying at this Botswana safari lodge can visit the Motswana village and learn about the cultural heritage of the area. Leroo-La-Tau provides guests with elegant accommodation in comfortable and modern chalets situated at the top of a cliff overlooking the Boteti River. Leroo La Tau accommodates 24 people in raised luxury glass and thatch chalets with en-suite facilities. Guests will find the lounge, dining area and bar inviting places to relax at this lodge in Botswana.